Recombining protein statistics for fractionated samples is both incredibly simple and robust with Progenesis LC‑MS v3.0. Simply analyse each fraction as normal, then import each of the single-fraction experiments into the multi-fraction workflow to regroup the runs by sample. Cross-fraction normalisation is performed automatically to compensate for different running conditions. 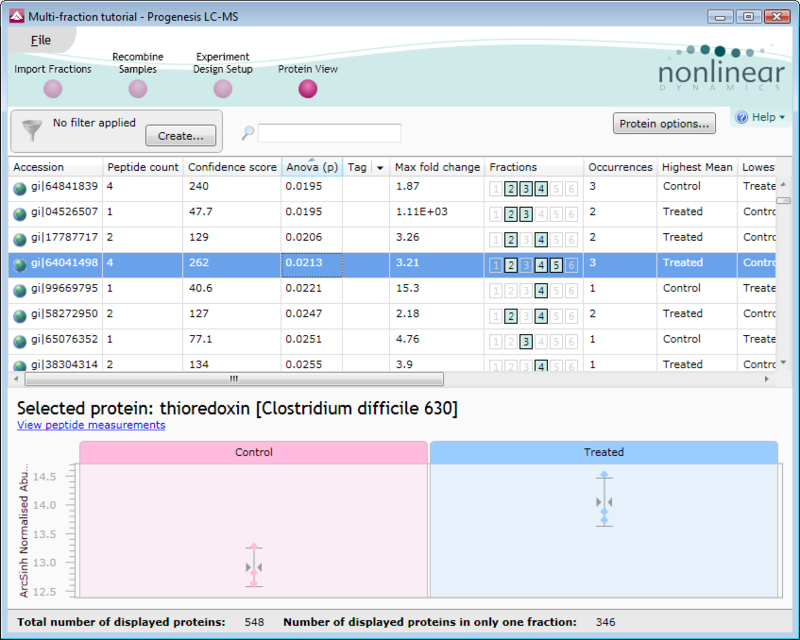 All protein statistics are then summarised in a single table, along with the expression profile of each protein shown across your experimental conditions. 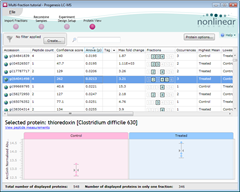 This provides a great way to see protein behaviour at a glance. For a quick look at the multi-fraction support, you can watch short demonstration videos for each of the four screens in the workflow. In Progenesis LC‑MS v3.0, each protein’s abundance is now calculated from only those peptides that are unique to the protein. This automatic approach gives an instant boost in productivity and further enhances the reproducibility of your analysis, as there is less reliance upon different users making the same decisions during peptide conflict resolution. As well as quantifying by unique peptides, proteins will now be grouped where the identified peptides of one protein are shared by another protein in your data. Again, this helps with both your productivity and the reproducibility of your analysis; identifications that were previously seen as conflicts can now be seen for what they are i.e. data for the same protein group. Both of these options are standard for any new experiments, and can be enabled for your existing experiments. One further way in which peptide conflict resolution can be simplified with Progenesis LC‑MS v3.0 is through its support for Scaffold, from Proteome Software. Use Scaffold to make sense of your identified proteins, then import the results directly, linking Scaffold’s high quality identification with the high quality quantification of Progenesis. The imported peptide percentile scores then make it even easier to resolve any remaining conflicts. After installing v3.0, simply download the Scaffold plug-in, install it and then restart Progenesis. It will then appear as an option on the Peptide Search screen. 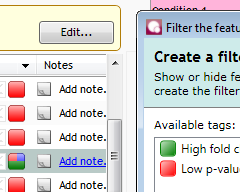 Tags are one of the most powerful ways of filtering and organising the data in your experiments. While they aren’t a new feature in Progenesis LC-MS, they’ve been substantially improved, making it much easier to perform common tagging operations and to combine tags in powerful filters. Active filter indicator: previously, it was too easy to forget that you had a filter applied, but no more; above each list of features, there’s an indicator to show when a filter is active. The updated tagging FAQ gives full guidance on the new interface. And thanks to everyone who provided feedback on the tagging and filtering features, not least those who took part in the Northumbria University sessions. If you’re using a spiked sample, you now have the flexibility to normalise to the subset of features corresponding to your spike. In fact, this feature isn’t just useful for people using spikes; it can also be for samples where it’s not valid to assume that the majority of proteins are unaffected by experimental conditions. You can find the new options in the Normalisation Method tab of the Review Normalisation screen. As well as those already described, there are many more smaller features added in version 3.0 of Progenesis LC‑MS; more than a short blog post can adequately cover. Perhaps the best thing to do is to download it now, try things out for yourself and make the most of the FAQ and videos. And if you have any further feedback you’d like to offer for future releases, we’d love to hear about it. We’re always listening. This entry was written by Mal Ross, posted on November 19, 2010 at 11:52 am, filed under November 2010 and tagged Progenesis LC-MS. Bookmark the permalink. Follow any comments here with the RSS feed for this post. Post a comment or leave a trackback: Trackback URL.